Clutch shooting isn't easy, and neither is defining it. The NBA defines clutch shooting as any shot taken in the last five minutes of the game in which the score differential is within five points. For this post, I will introduce a new interactive tool that uses my win probability model to classify shots into four categories: Garbage Time, "Normal" Basketball, Clutch Situations, and "Double Clutch" situations. With these four new shooting categories, we can dive deep into which players are taking and/or making the most clutch shots. As I called out in a previous post on clutch performance, there is nothing inherently wrong with the NBA's definition of clutch performance. There's something to be said for easily applicable rules that are simple to explain. However, a shot taken in the final minute when your team is up by five doesn't feel quite as "clutch" as a three pointer in the final 10 seconds with your team trailing by two. Fortunately, we can use win probability to create a more nuanced version of clutch, and one that better aligns with what one would expect a clutch situation to be. At its core, a clutch shot is one in which the outcome of the shot matters; when there is a significant difference between a make and a miss. How do we quantify that difference? 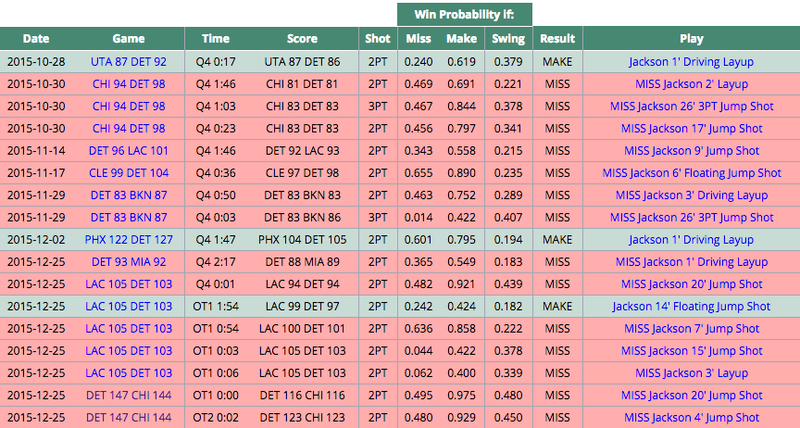 For every shot taken, we can calculate the win probability for both a make or a miss. The win probability difference between the two potential outcomes, the "swing" factor, tells you how important the shot is. 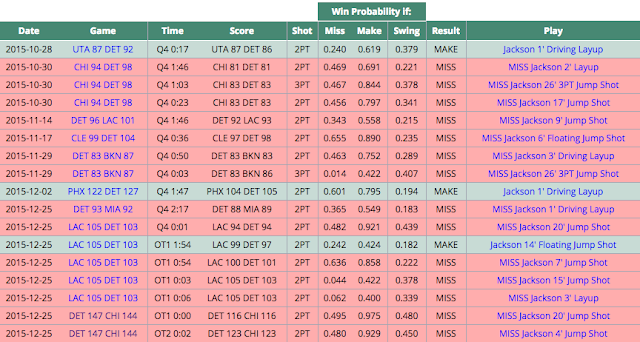 A shot as time expires when trailing by one will leave the team with a win probability of 100% if successful, and 0% if unsuccessful - a maximum swing of 100%. There is nothing particularly scientific about the definitions above. My overall goal was to have "normal" basketball apply to about 75% of shots. 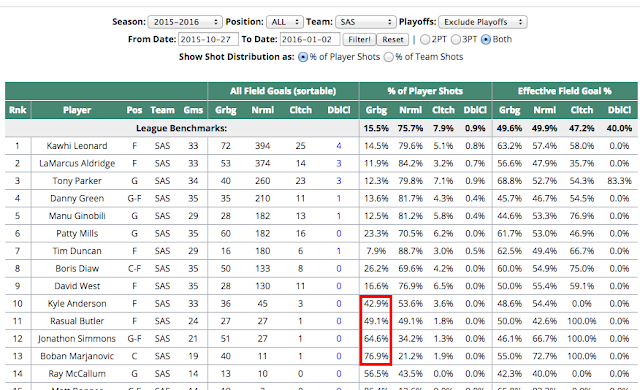 I wanted clutch to be in the range of the top 10% of shots, and "double clutch" to be the top 1%. Double clutch shots are intended to be the highlight reel shots; the ones that build, or destroy, a player's legacy. You'll note that I have different boundaries for two point and three point shots. Three point shots, by their nature, will have more "swing" than a two point shot. Because I wanted my distribution across the four categories to be consistent for both types of shots (e.g. double clutch to be the top 1% of a two or three point shot), the three point boundaries were expanded to meet that goal. Unless the game is really out of hand, all of the first half falls under normal basketball. As we progress through the third quarter though, garbage time starts encroaching on normal basketball. 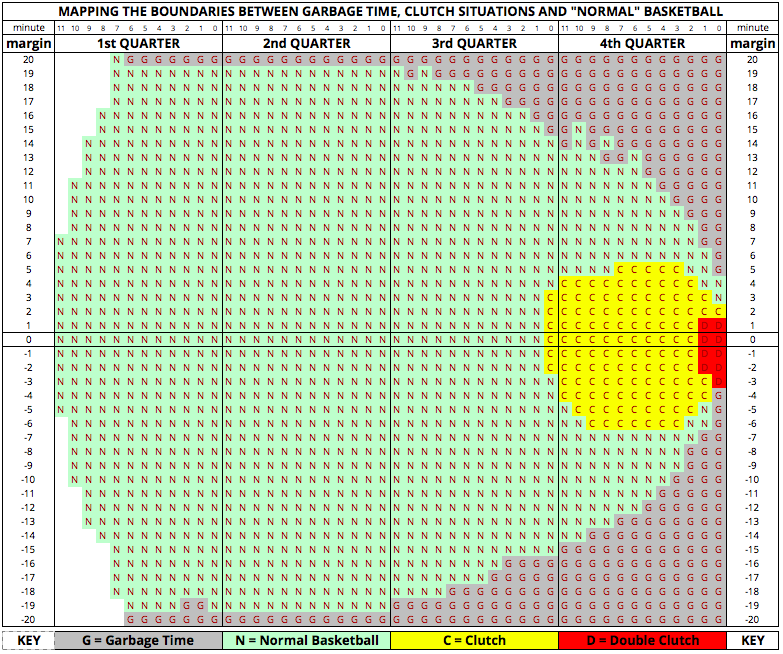 That trend continues throughout the fourth quarter, to the point that some "clutch" situations according to the NBA definition are actually garbage time according to mine. Clutch situations start emerging at the end of the third quarter, and in general apply when the score is within five points in the fourth quarter. That small patch of red correspond to double clutch situations. Note that double clutch is not symmetric with respect to scoring margin. A shot can be double clutch when a team trails by as much as three but the lead can be no more than one point (in most situations). The table is sorted by number of clutch shots taken (the column headings are sortable). James Harden leads the league this season, with 83 clutch shots taken. Those 83 shots made up 12.3% of Harden's field goal attempts, higher than the league average of 7.9%. His effective field goal percentage (eFG%) on those shots was 50.0%, slightly above the league benchmark of 47.2% for clutch shots (in general, field goal percentage decreases as clutch increases). While Harden has been above average this season in clutch situations, the Suns' Brandon Knight and the Timberwolves' Zach Levine are having a horrible time in the clutch so far. Brandon Knight is shooting just 29.4% eFG on his 63 clutch attempts, and Zach Levine is even worse, shooting just 25.4%. 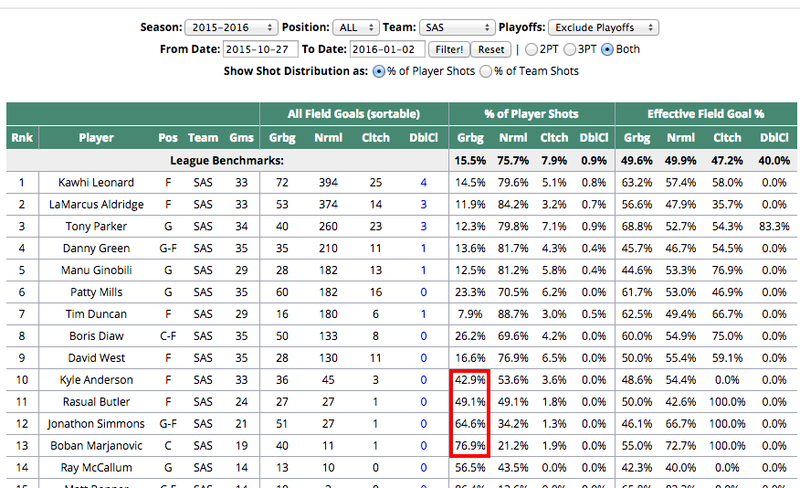 We can also sort the table by "Double Clutch" shot attempts (click the "DblCl" column). This is the shot by shot detail for Jackson's double clutch attempts. For each shot, you get the game situation (time remaining, score), the win probability of both a make or a miss, and the actual shot result. When available, the "Play" column will link to to nba.com video of the shot. The rows are color coded, with green indicating a make, and red indicating a miss. Jackson's table is a sea of red, having made just 3 of his 18 double clutch shot attempts this season. Stephen Curry, that walking outlier, has shot 69.2% eFG on his 13 double clutch shot attempts. His eFG% is greater than 60% across all four situational categories, and does not show the typical drop off in efficiency we usually see in clutch and double clutch situations. This is the main reason why Steph is dominating the win probability added race this year. As one might expect, when it comes to double clutch situations this season, the vast majority of shots (86%) have been taken by either Russell Westbrook or Kevin Durant. 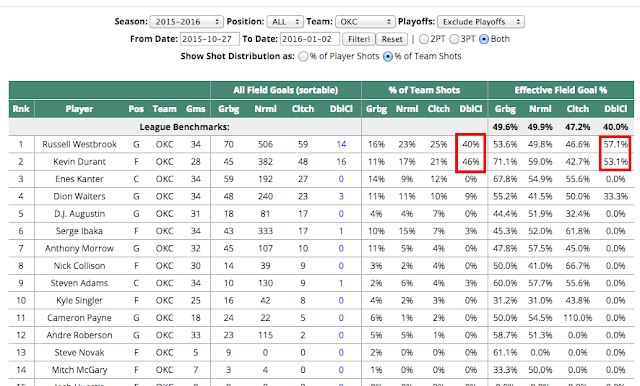 Both are shooting above average in those situations thus far (Westbrook at 57.1% eFG and Durant at 53.1%). Last season, with Durant out due to injury, double clutch shot attempts were spread more evenly across the team. 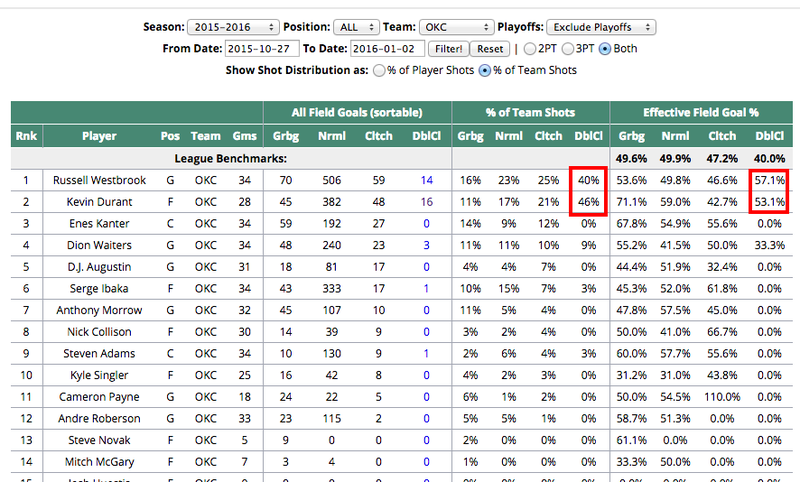 But Westbrook was still "the Man", taking 44% of his team's double clutch shots attempts, with an eFG% of 21.4%. Kyle Anderson, Rasual Butler, Jonathon Simmons, and Boban Marjanovic don't take a lot of shots, but when they do, a disproportionate amount of those attempts come during garbage time. If you want late career Kobe Bryant in a nutshell, look no further than the Lakers' clutch shooting report from last season. Bryant, despite playing just 35 games, still managed to take 44% of his team's double clutch shots. And he shot just 24% eFG on those attempts. To his credit, Kobe has not been quite as selfish this year. He still leads the Lakers in double clutch attempts, but his share is down (from 44% to 29%), and his efficiency is up (from 24% to 50%). As with the box scores, player win probability added, team summaries, and advanced per possession statistics, these reports will update daily with each batch of new games.